Our nice Guide will greet you at the airport and transfer to your hotel for check in,tomorrow will start your great tour. Xinjiang International Bazaar is very unique and combines different cultures. 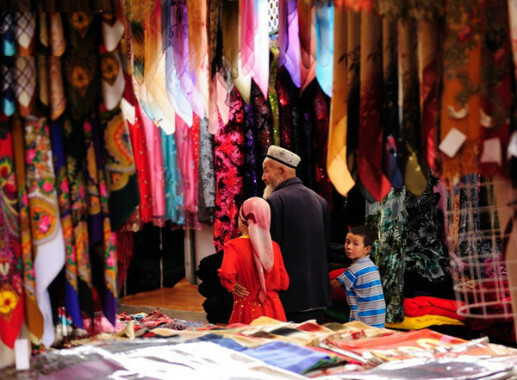 There are stalls selling an incredible selection of items from the local Uyghur Ethnic Minority Group, Russia, and China. "Bezeklik" means "a place with beautiful decoration". There are 83 numbered caves; among them 40 preserved murals totaling 1200 square meters. These caves are first excavated in Qu`s Gaochang period. The Flaming Mountain is located in China Xinjiang, which is a barren, eroded, red sandstone mountain. The erosion of the sandstone rock has given the mountain an appearance of being on fire. Jiaohe Ancient City is located 10 kilometers west of Turpan in China's Xinjiang Province, the Jiaohe Ruins is an archaeological site which was an important stop on the Ancient Silk Road. It is the largest, oldest, and best preserved earthen city on earth. Take a morning flight to Kashgar. Located in the city east, Kashgar Grand Bazaar, Sunday Bazaar, Mal Bazaar or the livestock market on Sundays, daily Yengi Bazaar etc. show the glory of the largest international trade market or fair on ancient China Silk Road. "Id Kah" means "a place of praying and celebrating in festivals". The Id Kah Mosque is located on the central square in Kashgar City, Xinjiang Uigur Autonomous Region. As the biggest mosque in China, it is a group of old Islamic constructions with strong ethnic style and religious features. Transfer to Osh in the morning. Osh is the second largest city in Kyrgyzstan. It is located in the Fergana Valley in the south of the country and often referred to as the "capital of the south". The city is at least 3,000 years old, and has served as the administrative center of Osh Province since 1939. The city has an ethnically mixed population of about 255,800 (in 2012), comprising Kyrgyz,Uzbeks, Russians, Tajiks, and other smaller ethnic groups. The Sulaiman Mountains or the Kesai Mountains form the eastern edge of the Iranian plateau where the Indus River separates it from the Indian Subcontinent.Bordering the Sulaiman Range to the north are the arid highlands of the Hindu Kush, where more than 50 percent of the lands lie 2,000 meter above sea level. Amir Temur Square is situated in a picturesque place of the Tashkent city. It is an ideal place for local people's entertainment, particularly in hot summer; the beautiful fountains provide cooling moisture for travellers. Kaffola Shoshiy Mausoleum is a asymmetrical domed mausoleum that was built in 1542. The complex of the mausoleum included a mosque and oshhona – room for cooking. Some recent burials (sagana) are available in a small yard. Ichon-Qala Gates are composed of four gates. The North , East and South Gates are known as, respectively, the Bogcha-Darvoza (Garden Gate), Polvon-Darvoza (Strongman's Gate) and Tosh-Darvoza (Stone Gate), and the twin-turreted West Gate which is the main entrance of the old city. The mud walls are of 2.5km in length, dated from the 18th century, and were rebuilt after being destroyed by the Persians. Minaret means "Low tower". It is located in the inner of Khiva. The building was erected in the 19 century. It is unique that it was incompleted. After breakfast drive to Bukhara through Kyzyl Kum Desert. On the way, stop for some Refreshments and explore this unforgiving landscape. Places to visit: Old Quarter, Old Town Center,The Ark, Mausoleum of Ismail Samani, Summer Palace of the Last Emir,Char Minar. Bukhara's old town can be found at the center of the modern municipality. It's full of ancient gems implication. The time of construction of the Ark Citadel is thought to be the beginning of the 1st millennium A.D. The overall area of the fortress is 34,675 square meters. Ak Saray palace was built in Shakhrisabz in the time of the Temurids. Its fantastic ruins can be seen from afar and make a deep impression. Kok-Gumbaz Mosque was built in 1435-1436. It is the largest Friday mosque in Shakhrisabz. Guri-Emir Mausoleum occupies an important place in the history of Turkic-Persian Architecture as the precursor and model for later great Mughal architecture tombs. It was built by Timur's Persianised descendants, the ruling Mughal dynasty of North India. The Afrosiab Museum was built around one of Samarkand's more important archaeological finds, a chipped 7th-century fresco of the Sogdian King Varkhouman. Ii was only discovered in 1965 during the construction of Toshkent yo'li. Kukeldash Medressa is located on a high hill in the area of Chorsu square. The builder of the madrasah was a vezir of the Tashkent khans (1551-1575), called Kukeldash ("the foster-brother of the khan"). The madrasah has a traditional composition: an extensive court yard, built on khudjras, with darskhana and a mosque in the corners. It's the History Museum of Uzbekistan and the Museum of Fine Arts. After breakfast trip will end and you will take a flight to your destination.